As with most buildings, the exterior and interior design of hotels rarely provide an expression of the lifestyle of the people staying there, other than perhaps their income. At the same price range, most hotel rooms pretty much look alike. However, one hotel is breaking that mold, and hopefully it will set higher standards for how residential buildings are truer to their tenants inside and out. 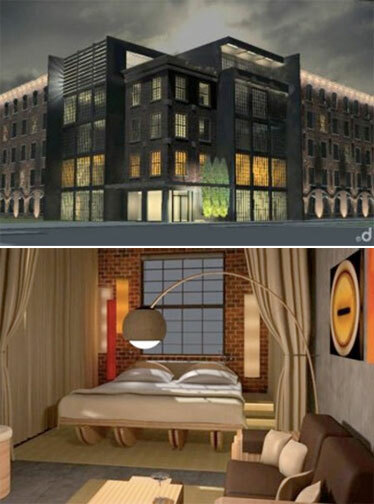 Based on the pictures, it’s easy to see that Nylo Hotels is beating to a different drummer. Each hotel will feature a 24-hour restaurant, game room with foosball and billiards, and a common area designed specifically for socializing called The Loft, a high-energy public area that will invite guests to work, shop, meet, drink, dine or relax. They also don’t have hotel rooms, but guest lofts with 11 foot ceilings (when’s the last time you’ve seen that in a hotel? ), oversized windows and wi-fi (of course). The work of local artists are displayed throughout the hotels, chosen via contests, and even their >website is entirely unique to a hotel. The first hotel opens in Plano, TX at the end of the year, then Providence the year after. The value of the NYLO model is similar to that of Nau’s (covered previously here) – learn from what the most progressive corporations are doing and apply them locally. Read more about its branding here.